Ms. Pranitha – Our Olympian!!! RDF students have been excelling in various aspects of their school/ college life. Every year more village children receive quality education, setting the foundation for brighter futures for themselves and their communities. In addition to the performance of the students in exams, RDF is proud of the individual accomplishments of its alumni, who have either gone for higher education or started careers as police officers, teachers and Railway employees. Many have not forgotten RDF’s role in its contribution to their success and have been giving back to the school. Guguloth Madan Lal is the son of agricultural labourers, he always assisted his parents whenever he could and simultaneously studying hard. With an Engineering Diploma from Govt Polytechnic, Warangal and a B. Tech from Vasavi Engineering College, Hyderabad; Madan’s toil paid off with 2 job offers – one as a junior scientist at the National Nuclear Energy Reactor in Kalpakkam, Chennai and as an Electrical Engineer for the State Electricity Board. He chose to take up the former offer. Students like Madan Lal prove how every person can be the change they want to see in their lives. It’s an honour for us to have alumni like Madan who prove to be such an inspiration for our students! Guguloth Srinivas recently completed the National Industrial Security Force training and has already secured a job. The son of daily wage earners, Srinivas and his parents shared their happiness by sponsoring the Midday Meal program in the school. Like many of our alumni, he too has pledged to help the school in whichever way he can in the coming years. We feel so proud of his gesture! P.Gauthami is now serving as constable and the photograph given below shows her receiving appraisal certificate from Warangal SP. Santhosh: He is serving as an Indian soldier. He was the first RDF alumnus to be selected for the Indian army. He was an average student but he was interested in RDF values & traditions. He completed his intermediate & degree in Siddipet. Now he is serving in Kashmir. His dream is to reach the highest position in the army. We all are very proud of Santhosh and his achievement. The whole village and RDF schools congratulate him on the great achievement. Jai Jawaan and Jai Kisaan! Rupa and G. Manga (2006) completed their Engineering course in Karimnagar and Siddipet respectively and are working. P.Swamy (2008) He completed his Graduation in Siddipet is working as police constable. Laxmi(2008) completed her TTC (Teachers Training Course) last year. She got a Government Teacher job in Medak district. She helped the school by sponsoring mid day meal. Sumalatha (2009) Completed her 10th class and being a good sports person , got a job as an Excise constable. Praveen (2006) completed his ITI now he is doing as electrical linemen in Vittalapoor, Siddipet district. Bhagyalaxmi (2006) completed her MCA and now working in Hyderabad. Babu (2008) completed his Degree along with skills training provided by National government scheme and now working in Bihar as a supervisor. Ch. Saraiah (2010): After completing his Degree, he got a job in National Industrial Security Force. Presently he is undergoing training. Chandulal( 2012) is a very talented sportsman . At present he is the coach at the Archery academy of RDF Vanitha Actuchapai Vidyalaya, Kalleda. Sharadha (2008) completed her Bachelor Degree in arts. She is presently working as an Anganvadi Teacher. Neela (2006) completed Intermediate. Now she is working as an Anganvadi teacher at Doulath Nager. Ramesh(2003): After completing his B.Sc, B.Ed, is now working with RDF Kalleda School as a General Science teacher. Srivani(2004) completed BAMS and is working in Hyderabad. Ashok(2004) taught at Kalleda School & was the Admin Asst there. Now he has been posted as the School Education coordinator with the Tech Mahindra School, a quality alliance between RDF & TMF. Sravan Kumar (2004) has been working with Synchrony Financial, formerly known as General Electronics at Hyderabad. Rajeswar(2004) has been working as a Lab technician at Datthu Nursing Home, Thorrur. Anil (2005) has completed B-Tech and working as a software engineer at GREDLEX Company in Hyderabad . M.Maduri Chaithanya (2006) is working as a software engineer at Value Labs. Raju(2006): After completing his B.Tec, he is now working in Vishakapatnam. Raju(2006) obtained a job in the Indian Army because of his archery skills. In his attempt to give back to the school, he plans to use a portion of his salary to sponsor an RDF student. Maheswari(2006)is presently working as a teacher in Puttaparthi. Raju(2006) obtained a job in the Indian Railways because of his archery skills and chose to give back to school by sponsoring a mid-day meal. Vijender(2006)has completed his B-Tech. Now he is working as substation operator at Ranga Reddy. Shankar (2006) was selected as a police constable and is working at Hanamkonda. Raju(2007) obtained a job in the Indian army due to his archery skills. He plans to show his appreciation by sponsoring the physical education teacher’s health insurance. Anil(2007) was passionate about computers in school and completed a course in Hardware. He has been posted in the TMF School, Bahadurapally as Computer faculty. Raju(2007) is working as junior physical education teacher at Kalleda School. Bhadri(2007) is presently working as an Aganwadi teacher in her village. Binduja (2008) is working as a software engineer at Hyderabad. Rajitha (2008) is very talented in games and sports. She completed B. P.Ed at Khammam. Ranjith(2009) obtained a Junior Assistant job in the Indian Railway at Kolkata. Prasanna Kumar (2009) was selected to TATA Archery Academy at Jarkand. He participated in many state and national level competitions. Jyosthna ( 2009) was a good student. She completed Bachelor’s degree in Hotel Management at Hyderabad. 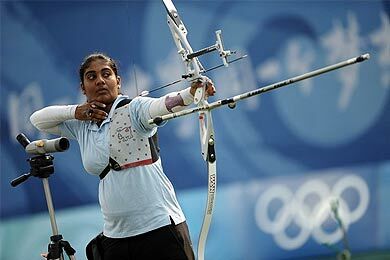 Sharadha(2010) participated in an international Archery meet in USA and she has now got job in Railways.